Last week we talked about a robot made entirely of rubber, and he appeared in the anthology title Mystic Comics #1. I’ve been noticing that a lot of the superheroes that have appeared on this blog series actually got their start on this title so it got me a bit curious, who’s the man on the cover? 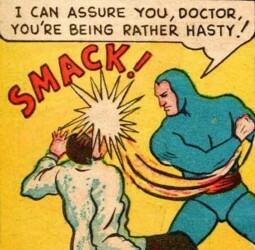 He’s clearly a superhero and capable of handling himself in a fight. It appears that he’s incredibly strong and fearless if he’s able to hold all those monsters at bay and from the bullet striking him in the chest it appears that he’s practically bulletproof. Also, it seems that he really likes the color blue and sadly, that costume isn’t very original or exciting. 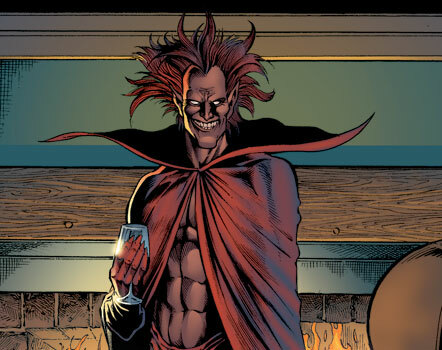 Well, it turns out his name is the Blue Blaze and, bland costume aside, he’s actually pretty interesting. The Blue Blaze’s real name was Spencer Keen and while his date of birth isn’t known it’s established that he was a young adult in 1852.
who had discovered a mysterious “blue blaze” that had the power to bring dead animals back to life. Spencer had been visiting his father while on his way to a costume party, where he had chosen to wear the blue suit that would eventually become his superhero outfit. Unfortunately, they were living in the Midwest of America where tornadoes are incredibly common. Sadly, this was before advanced early warning systems were in effect and the tornado destroyed most of the town, killing Arthur Keene, most of the town, and shattering the container that contained the Blue Blaze and spilling it on Spencer. In the wake of the incredible tragedy the town tried to recover. However, in the confusion of the disaster, nobody bothered to check and see if Spencer was dead. In a rather horrific twist of fate he was buried alive and remained buried until the 1940’s. 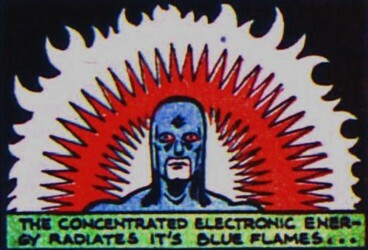 Fortunately for him, the strange substance of the Blue Blaze didn’t just keep him alive, it gave him “strength a thousand fold by means of substrate dermatic rays” (whatever the hell that means) and in 1940 he arose from the grave because he “was made conscious of the slow dominion of evil”. The Doctor’s grand scheme was to reanimate corpses into an army of zombies in order to take over the world, proving that our fascination with zombies is nothing new and will probably never die. 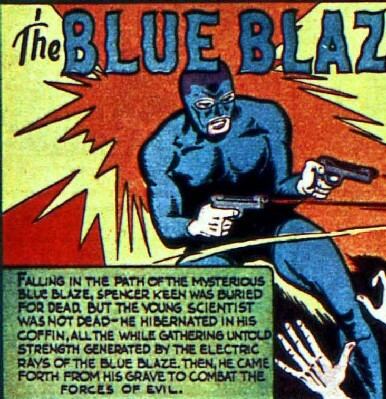 It should be noted that on the spectrum of violence in early Golden Age comic books the Blue Blaze took the “I have no trouble with using lethal force” approach and the evil doctor was killed when his lab exploded. In his second adventure the Blue Blaze confronted another mad scientist named Karl Barko. Barko was an inventor and in his story he was attempting to run a protection racket where he would blow up mine shafts filled with people if the mining companies didn’t pay up for his inventions. While Barko attempted to use gadgets such as “freeze rays” and special explosives to combat the Blue Blaze but was quickly defeated and shipped off to a mental institution. who was using star rays to create monsters that fought for him. I bring this up because this adventure was the cover story of Mystic Comics #3, and his home to what I think is one of the greatest comic book covers ever. The Blue Blaze would go on to have one more adventure where he traveled to Eastern Europe in order to stop the Trustees of Hate from provoking a war between the fictional countries of Borsia and Gratzia. While the Trustees of Hate were headed by the awesomely named “Dr. Vortex”, the Blue Blaze defeated them fairly easily. 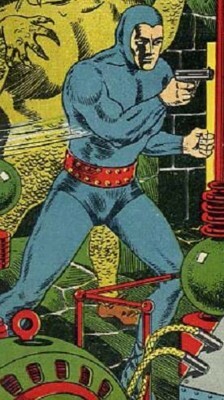 His battle with the Trustees of Hate would be his last and Blue Blaze would disappear from comics in August of 1940. However, the writers must have thought that they should leave a backdoor open in case the Blue Blaze would make a comeback because in his last adventure they make it known that every time he defeats evil he travels back to the grave in order to wait for the next crime to solve. For some reason there are strange cosmic forces at work that move his body around to “new centers of crime” and when he is needed he will wake up to do battle with the forces of evil again. 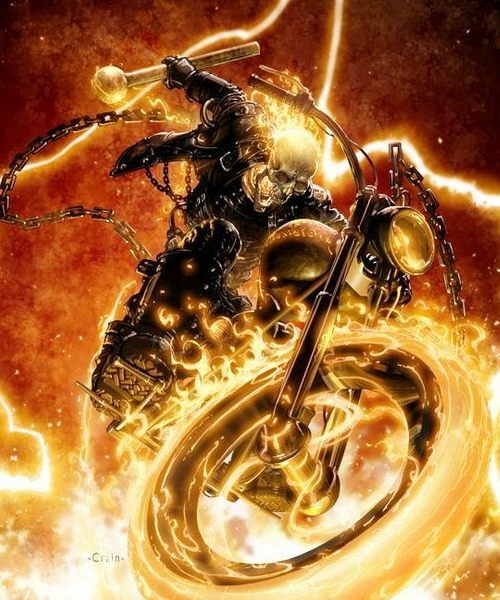 To date the Blue Blaze hasn’t had a modern incarnation or revival like some of his other Golden Age companions. Looking back it is easy to see why, his costume is kind of boring and while he does have a cool origin story and fought some pretty interesting villains it is easy to assume that he simply got lost in the crowd. 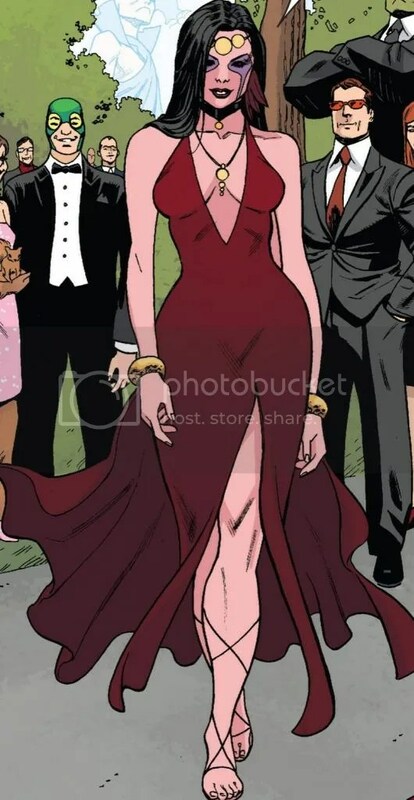 I think the Blue Blaze would fit right in with the right writer and costume change. This entry was posted in Blog and tagged 1940's, Blaze, Blue, Blue Blaze, comic, comic books, comicbooks, comics, Golden Age, Golden Age of Comics, Heroes, history, mad scientist, Marvel, Marvel Comics, Marvel studios, Science fiction, super hero, super villains, superhero, Timely Comics, Undead, zombies. Bookmark the permalink.